I wanted to follow up Caroline’s really helpful how-to’s on converting a CV into a resume by focusing on my own real-time experiences of doing just that, particularly some of the more intangible aspects of the process. 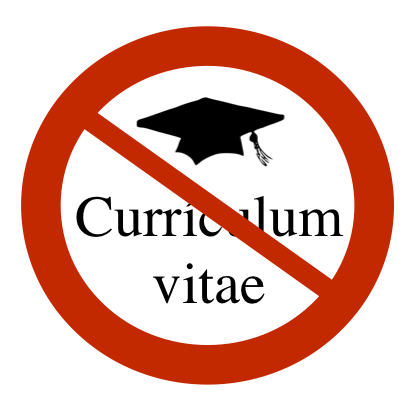 What makes turning a CV into a resume all the more difficult is the psychological baggage that goes along with it, since it can symbolize something you wish it didn’t–that you might be becoming a post-academic. It’s not so much figuring out a new set of conventions that’s the tough part, but the self-scrutiny and rose-colored reminiscences that can really paralyze you. Writing a resume feels like a surrendering the past to the future, when paring 5 pages down to 1 page feels like you’ve just ended up with a blank page. Here are some of the mixed feelings I’ve dealt with in writing a resume and what I’m telling myself I need to do to thoughtfully and seriously prepare for a transition. 1. Get(ting) over it: Does shearing off all the details of your CV feel like your academic achievements don’t matter? What exactly happened to the last 5 to 7 (to 10) years of your life? Do your faculty recommendations even matter any more? Going through your CV to decide what to keep (a little bit) and what to ditch (almost everything) is a daunting task, because it requires a retrospective introspection that isn’t easy, especially when you’re forced to do it. If don’t read the whole book or the whole section on resumes, the first lines of the chapter tell you everything you need to know about how to approach the process, counter-intuitive as it may seem: “It’s not about you. It’s about the job” (99). 2. Be practical: If you’re anything like me, the “objective” sentence of the resume is the hardest–which is probably symptomatic about the ambivalence and cluelessness many post-acdemics feel when plotting a transition. Just how do you boil down your goals into (preferably) a one-line sentence and your whole grad school experience into a one-ish page document? The way I look at it is to tackle the resume as an intellectual exercise: We’re supposed to be good writers (especially if we’re in the humanities), so we should be able to take on the challenge of writing a succinct description of our experiences and skills, right? It’s just that the goal of a CV and the objective of a resume are completely opposite ones, where the former is about padding and the latter values being concise. (Though this post about resumes is anything but!) You can do some quick revision jiu-jitsu once you remember that about half of your CV was padding in the first place. Hey, at least you won’t be tempted any more to include in-class lectures you did as part of your job as a TA as an “invited lecture” on your CV, like that annoying, overly professionalized classmate of yours did. 3. New attitude: Whether you use an axe or a scalpel, cutting down many pages of a CV into many fewer pages of a resume can feel like quite an accomplishment. So it’s not quite the catharsis you might need to leave academia behind for good, but it can change your perspective of yourself after you’ve only identified yourself in one way for so long. Far from making all the achievements you’ve edited out appear useless, converting your CV into a resume can help you discover and focus on all the skills you’ve acquired that you hadn’t realized you possessed. Just think of the CV as a record of accomplishments that has been an end in itself and not just a means, and the resume as more than just an unfaithful, inaccurate copy of the CV, but as something that dynamic and real in and of itself.